It isn’t always easy to find a card to give a priest on his jubilee or a sister as she takes her vows. Now you’ll be able to get those and other priestly/sisterly cards from the Holy Store online and at our Holy Store in town. There are cards to welcome a priest when he comes to your parish, and to bid him farewell if he leaves. 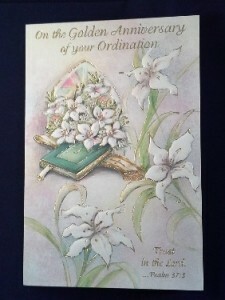 Of course, we have ordination cards for both deacons and priests as well as silver, ruby and golden jubilee cards. 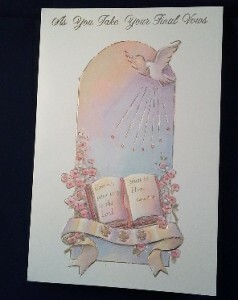 When you go to the Holy Store online, look in the Greeting Card category or click here. We’ll be adding more cards and a greater variety in the future. Thanks for shopping at the Holy Store!